I haven’t felt great today, so I’ve hung out in bed; watching TV. I’ve also been on the phone, dealt with some insurance stuff, done some reading and writing, handled emails & texts, and surfed social media while watching TV. I could tell you some of the stuff I watched, but I know I missed more than I caught. When I decided to eat something a little bit ago what I wanted was a soft-boiled egg. Now, I’m pretty flexible on most things food-related, but I want perfection when it comes to a soft-boiled egg. It needs to have a completely set white with the yolk just begining to set around the edges, slightly thickened, but still loose enough to sauce over the white. It’s a very precise process. At the moment the 1/2″ of water comes to a boil I slip the egg in, cover, allow to boil/steam for 6 minutes and 30 seconds then immediately plunge the egg into iced water for 10 seconds, and eat at once. However, if at any point in the 6:30 I’m not seeing steam escape around the edges of the lid I know I’ve had the heat up too high, or let it boil for too long before covering, and my pan has gone dry – this is bad. It will crack the shell, not only ruining any chance at a perfect egg, but making a mess in my pan. 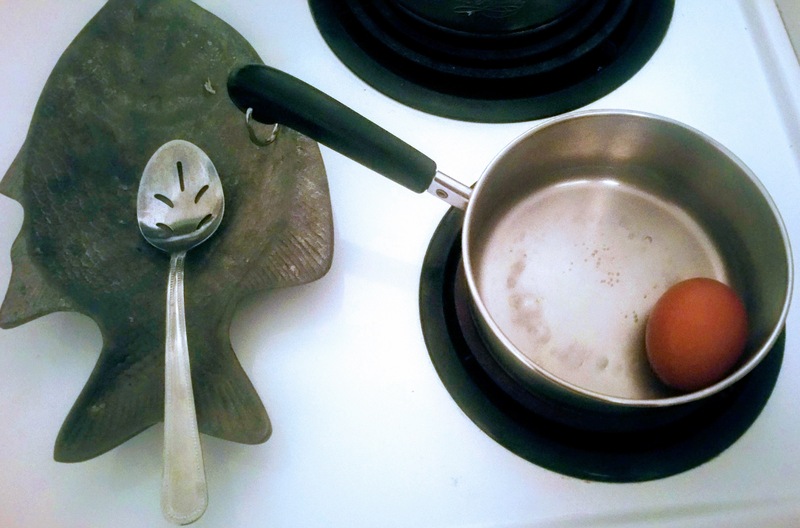 Once I decide to make the perfect soft-boiled egg there is no sitting down to check email, or running downstairs to switch out the laundry, or loading the dishwasher…(ask me how I know,) I’ve got to watch my egg. So I do. I stand right there, in front of the stove, watching my egg. I guess I watch differently when it’s something that matters to me.